Steve Peers: The Refugee Crisis: What should the EU do next? VU University Amsterdam has released a border death database documenting migrant deaths along the Southern European borders. Here is a web post from DIIS (Danish Institute for International Studies) describing the project: “On 12 May 2015, researchers of VU University Amsterdam released a border death database, based on official death records of migrants who died at the Southern European borders in the years 1990-2013. They suggest that European states continue to collect such data supervised by a new European Migrant Death Observatory which is should be part of the Council of Europe. The database contains individualized information on 3.188 people who died while attempting to reach southern EU countries from the Balkans, the Middle East, and North & West Africa, and whose bodies were found in or brought to Europe. It is unique because it includes – where known – date and place of death, cause of death, gender, age, country of origin, and whether or not the person was identified. Over the past year, 13 researchers visited 563 local civil registries in Spain, Italy, Greece, Malta and Gibraltar and collected information from death certificates. “This database underlines decades of indifference of European states. They had this information all the time, but failed to collect it”, says Professor Thomas Spijkerboer. See also: The short documentary Counting the Human Cost of Border Control, in which Thomas Spijkerboer and Tamara Last (Migration Law, VU University Amsterdam) search for traces of those who have died in the civil registries along the Mediterranean coast. “Drowned Europe“, policy brief by Philippe FARGUES and Anna DI BARTOLOMEO, Migration Policy Centre at the European University Institute, Florence. The drowning of 800 migrants, 19 April 2015, after the capsizing of a smuggling boat, triggered responses from across Europe. But when EU leaders met four days later, the news-cycle had moved on and the European Council, 23 April, gave a disappointing response. The 28 agreed to scale up their joint search-and-rescue efforts at sea to the more substantial efforts of what Italy has achieved alone in the last year. There were, also, a handful of other minor actions. Mr Junker, President of the Commission, lamented that the EU should be more ambitious. He was right, in as much as the EU meeting will not sustainably curb the deadly trends we have seen in the Mediterranean in recent years. The Office of the High Commissioner for Human Rights yesterday issued Recommended Principles and Guidelines on Human Rights at International Borders. OHCHR, along with multiple stakeholders, has been working on the principles and guidelines since 2012. 1. International borders are not zones of exclusion or exception for human rights obligations. States are entitled to exercise jurisdiction at their international borders, but they must do so in light of their human rights obligations. This means that the human rights of all persons at international borders must be respected in the pursuit of border control, law enforcement and other State objectives, regardless of which authorities perform border governance measures and where such measures take place. 2. Migration discourse is replete with terminology used to categorize people who migrate, such as “unaccompanied or separated children”, “migrants in irregular situations”, “smuggled migrants” or “victims of trafficking in persons”. In the complex reality of contemporary mobility it can be difficult to neatly separate people into distinct categories as people may simultaneously fit into several categories, or change from one category to another in the course of their journey. Every individual who approaches an international border has different motivations and it is important to remember that under international human rights law, States have obligations towards all persons at international borders, regardless of those motives. 3. States have legitimate interests in implementing border controls, including in order to enhance security, to protect human rights, and to respond to transnational organized crime. The Office of the High Commissioner for Human Rights (OHCHR) has therefore put together these Recommended Principles and Guidelines (“The Guidelines”) with a view to translating the international human rights framework into practical border governance measures. The Guidelines assert a human rights-based approach deriving from the core international human rights instruments and anchored in the interdependence and inalienability of all human rights, seek to establish accountability between duty-bearers and rights-holders, emphasis participation and empowerment, and focus on vulnerability, marginalization and exclusion. 4. Further, underpinning these Guidelines is a recognition that respecting the human rights of all migrants regardless of their nationality, migration status or other circumstances, facilitates effective border governance. Policies aimed not at governing migration but rather at curtailing it at any cost, serve only to exacerbate risks posed to migrants, to create zones of lawlessness and impunity at borders, and, ultimately, to be ineffective. Conversely, approaches to migration governance that adhere to internationally recognized human rights standards, serve to bolster the capacity of States to protect borders at the same time as they uphold State obligations to protect and promote the rights of all migrants. Ultimately then, these Guidelines are recommended to States and other stakeholders not only because they are obliged to put human rights at the forefront of border governance measures, but also because they have an interest in doing so. Footnote 1 – In order to avoid duplication of authoritative guidance, the present Guidelines should be read in conjunction with the guidance provided by the Office of the United Nations High Commissioner for Refugees (UNHCR), including in the context of its 10-Point Plan of Action on Refugee Protection and Mixed Migration which emphasises the need for “protection sensitive entry systems” at international borders to identify, protect against non-refoulement and ensure access to asylum procedures for persons in need of international protection. For trafficked persons, the present Principles and Guidelines should be read in conjunction inter alia with OHCHR’s Recommended Principles and Guidelines on Human Rights and Human Trafficking. 1. States shall implement their international legal obligations in good faith and respect, protect and fulfil human rights in the governance of their borders. 2. States shall ensure that human rights are at the centre of the governance of migration at international borders. 3. States shall respect, promote and fulfil human rights wherever they exercise jurisdiction or effective control, including where they exercise authority or control extraterritorially. The privatisation of border governance functions does not defer, avoid or diminish the human rights obligations of the State. 10. States shall protect and assist migrants at international borders without discrimination. Human rights obligations, including in respect of civil, political, economic, social and cultural rights, must take precedence over law enforcement and migration management objectives. 11. States shall ensure that all border governance measures taken at international borders, including those aimed at addressing irregular migration and combating transnational organized crime, are in accordance with the principle of non-refoulement and the prohibition of arbitrary and collective expulsions. 12. States shall consider the individual circumstances of all migrants at international borders, with appropriate attention being given to migrants who may be at particular risk at international borders who shall be entitled to specific protection and individualized assistance which takes into account their rights and needs. 13. States shall ensure that all migrants who have suffered human rights violations or abuses as a result of border governance measures have equal and effective access to justice, access to effective remedies, adequate, effective and prompt reparation for harm suffered, and access to relevant information concerning violations and reparation mechanism. States shall investigate and, where warranted, prosecute human rights violations and abuses, impose sentences commensurate with the seriousness of the offence, and take measures to ensure non-repetition. Click here or here for Principles and Guidelines. Guest Post: The effect of negative labelling – Why are we still talking about ‘migrants’? More recently commentators have been at pains to distinguish between groups of migrants and refugees arriving in Europe by boat, noting that there are technical legal arguments to guide terminology as well as familiar tropes that we encounter through the use of one term or another. As Jesper Bjarnesen notes, refugees and labour migrants are intertwined. (3) This is why terms such as ‘mixed migration’ have become one way to bridge the sometimes blurry distinction between people who leave their homes due to political persecution and those who suffer economic hardship, acknowledging that the two can be related in situations of displacement and refugee outflows. Yet mixed migration still ties us to the word ‘migration’ which brings along with it polarising attitudes towards migration and competition over jobs. It also evokes less sympathy than refugee or asylum seeker, with migrants having fewer advocacy bodies and organisations fighting for their interests as compared to refugees. 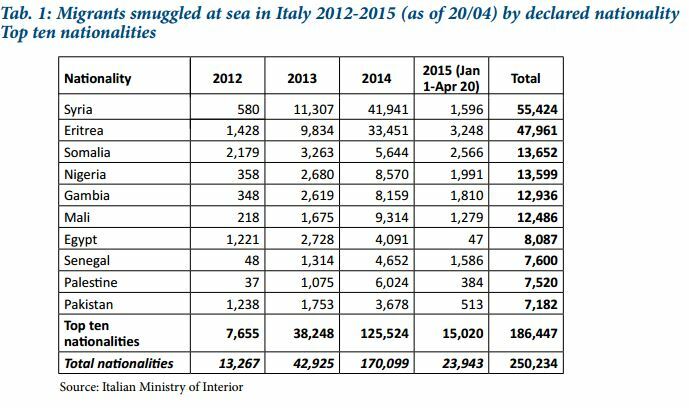 So what do the arrival figures along the Central Mediterranean route into Europe tell us? 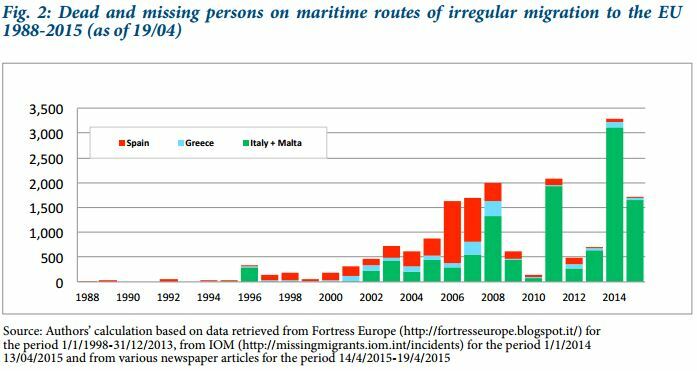 Frontex’s FRAN quarterly for Q4, 2013 explained that “the majority of African irregular migrants detected along the Central Mediterranean route were Eritreans”. The classification of Eritreans as ‘irregular migrants’ would seem inaccurate given that around 90% of Eritrean asylum seekers successfully claimed asylum in industrialised countries in recent years. (4) Eritrea is currently the subject of a United Nations Human Rights Council Commission of Inquiry and is known to be one of the poorest and most repressive countries in the world. The next largest group of arrivals originated from Syria and Frontex acknowledges that this group of people is escaping armed conflict in their country. However the Frontex report then goes on to refer to ‘migrant interviews’, once again conflating the terms migrant and refugee and using them interchangeably. Beyond technical distinctions over terms and language there is a lack of personalisation of the human side of asylum seekers, refugees and migrants seeking to enter Europe by sea. 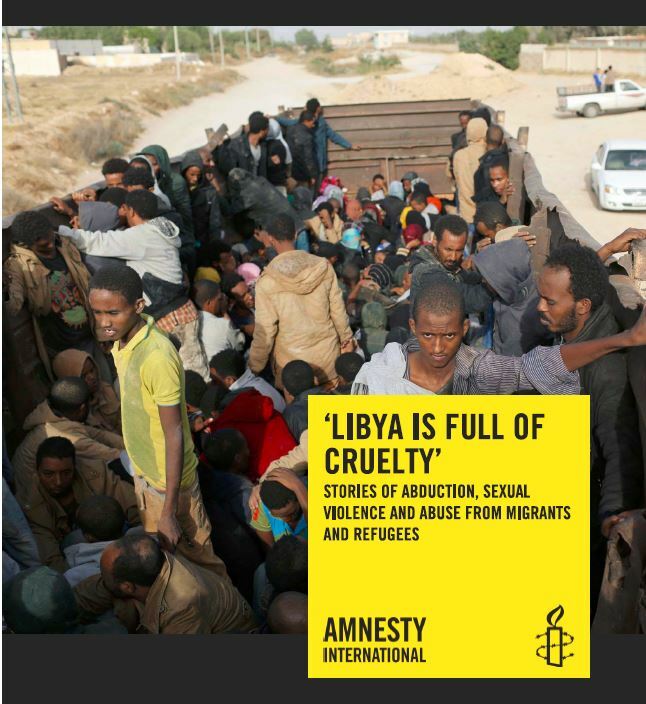 It can be very difficult to find individual stories behind the frenzied media headlines claiming thousands more people are potentially on their way to Europe by boat mainly departing from Libya. It is only through individual stories and nuanced accounts of why people leave their homes and their mixed motivations for departing, that we will better understand the factors driving mobility along this route which in turn can shape policy solutions. The upcoming United Nations High Commissioner for Refugees’ 2014 Protection Dialogue focuses on Protection at Sea and calls for responses that are sensitive to the specific needs of individuals and groups. (5) Assuming that all people have the same reason for leaving their homes and getting onto boats, that all people rescued at sea are migrants and that there is a one size fits all policy response misrecognises the heterogeneity of this group. Such heterogeneity includes country of origin, gender, age and family make up including pre-existing links to Europe. It is time we stopped talking solely about migrants and start to use more technically accurate and relevant labels. Until then we cannot readily respond to a phenomenon that is one of the most pressing and challenging of our times – assisting people in need of protection at sea. Dr Melissa Phillips is an Honorary Fellow at the University of Melbourne. (1) See for example, Pickering, S. (2000). “The hard press of asylum.” Forced Migration Review 8: 32-33 and Zetter, R. (1991). “Labelling Refugees: Forming and Transforming a Bureaucratic Identity.” Journal of Refugee Studies 4(1): 39-62. (3) Bjarnesen, Jesper (2014) ‘Refugees or migrants?’, Nordic Africa Institute, http://www.nai.uu.se/news/articles/2014/06/27/104657 .